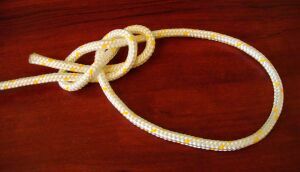 A Yosemite bowline is a secure loop knot. It is a bowline with the free end wrapped around one leg of the loop and tucked back through the knot. This method of tucking the free end is called the "Yosemite finish," and the Yosemite bowline is sometimes referred to as a "bowline with a Yosemite finish." This knot is occasionally used by rock climbers to attach the climbing rope to their harness, and rock climbers in Yosemite gave it its name. However, the easily checked figure-of-eight follow through is a more common choice for this purpose. This page was last edited on 31 March 2007, at 00:33.